What better gift for the appearance-conscious man in your life than a grooming kit? There are several different kinds of kits, all of which will help you or your man look and feel better. We’ve put together some of the best kits from a variety of them, so you should choose one based on what you need! Before we start looking at the grooming accessories, let’s take a look at some things that you should know. Type: There are a few different types of kits, though on this list we mostly went for manicure kits and shaving sets. Between them, you have everything you could need to get started, all in one convenient place! Pieces: How many things come with the set? When we counted, we included any cases or carrying boxes as an item in addition to the care accessories, soaps, and other kit essentials. Know what you’re getting! Case: We’ll tell you here if the kit comes with a case. This way, all of your accessories, soaps, and other parts of your kit are in the same place and you won’t lose them. Keep it all together. Comb: Does the kit come with a comb? Most of the shaving kits that we’re covering below will come with a comb to make sure that you keep your beard and mustache looking neat and put together. Scissors: Scissors are an important part of all grooming kits, so we’ll tell you if this particular kit comes with a pair or not. It’s great to know if you’ll need a separate grooming pair or not. Beard Oil: Beard oil is a great accessory for a shaving kit, so we’ll let you know if one is included. This can help you find new products to use, and it’s great to have them on hand. With all of that information down, we can get to the best male grooming kit reviews! We’ve done our research to bring you a variety of kits for the greatest value and gift-giving potential. Our top pick and budget pick are highlights, so take a look at them before moving through the rest of the kits on the list. We’ll help you choose a gift for yourself or the man in your life! Naturenics starts us off with the best men’s grooming kit on the market right now. 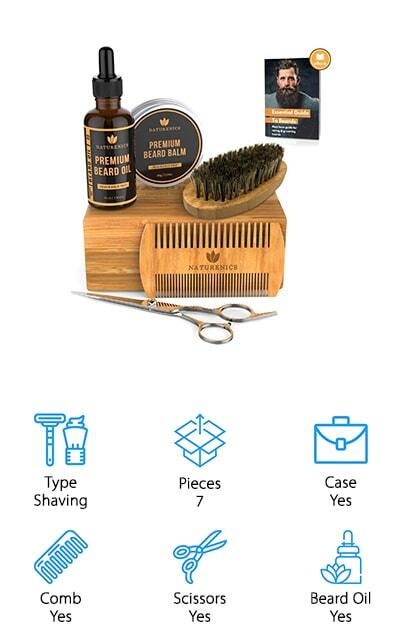 This is a shaving kit that comes complete with all the beard-grooming tools that you could need! Inside, you’ll find separate beard oils and balms, wax, and a dual-tooth comb with bristles spaced differently on both sides for optimal grooming options. You’ll also get a firm bristle brush for combing down your beard, barber scissors for trimming up, and a magnetic gift box that you can use to keep it all together. You’ll also get a grooming eBook that you can read for the latest tips and tricks. Every part of this kit aims to make your shaving and grooming experience a great one. The oil and balm hydrate your skin, while the brush exfoliates dead skin and distributes the product evenly. For beard care, there’s not a better kit available! Plus, all of the products are made with pure and organic ingredients. This cheap grooming kit by FAMILIFE is a great investment in your nail health. All of the tools are made of heavy-duty stainless steel that is resistant to rust and is shining and beautiful. It comes in a beautiful gift box package that you can wrap up to gift immediately. 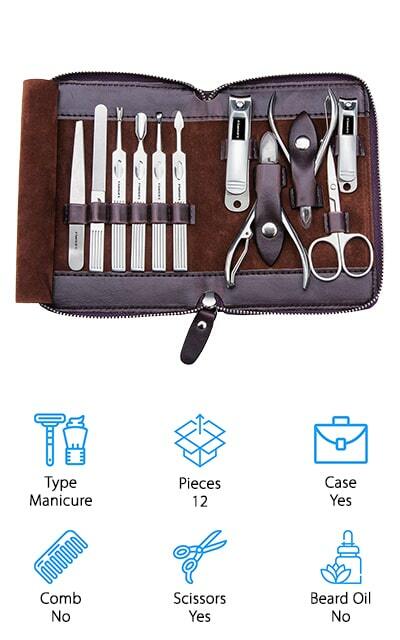 There are 11 pieces in this pedicure set, including a fingernail clipper, toenail clipper, cuticle nippers, and ingrown toenail clippers. You also get a cuticle trimmer, a nail polish pusher, a set of tweezers, scissors, and a nail file. You’ll also get a V-shaped cuticle trimmer and an ear pick. 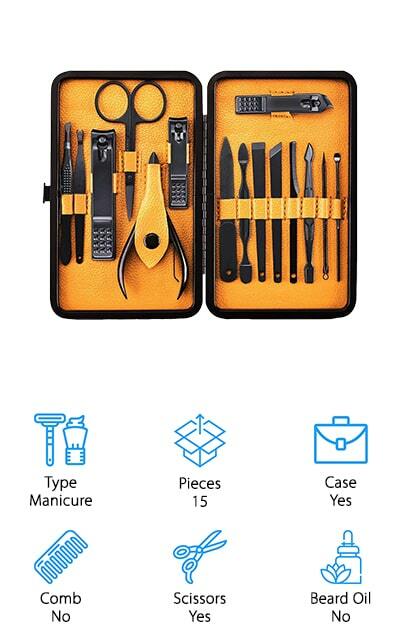 This manicure set is not just for your nails! It includes a portable leather case for travel, so you’ll always have the tools you need in case you need them on the go! Simply keep the tools dry and clean, and the blades will stay sharp while the rest of the tools stay shining and perfect. When you’re looking for the best male grooming kit, you can’t go wrong with a shaving set. 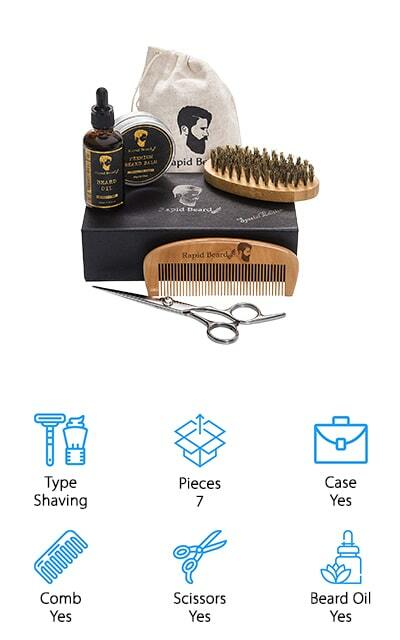 This particular set by Rapid includes a carrying bag for all of the implements, which includes a beard balm, beard oil, comb, boar bristle brush, and scissors. The scissors and comb will help you style your beard and keep it neat, while the bristle brush distributes natural oils and smooths even coarse facial hair. The balm and oil are made with pure and organic ingredients, with argan oil, jojoba oil, and Vitamin E as the active ingredients. This helps to hydrate and keep your beard soft while eliminating dandruff and itchiness. The wooden comb is static and snag-free, great for styling on the go, and the scissors can trim off all of the rogue hairs that have escaped your other trimming efforts. This kit includes everything you need to supplement your shaving experiences and pamper your facial hair. 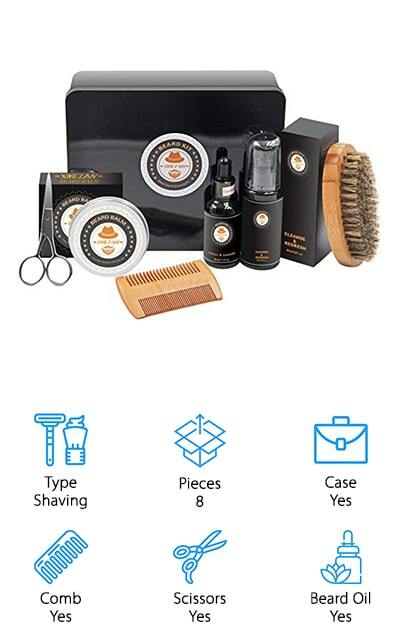 This 8-in-1 kit by XIKEZAN is the perfect gift for the shaving enthusiast in your life. 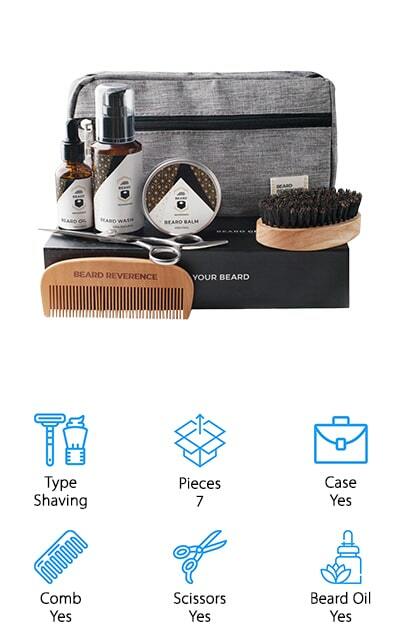 It comes with a ton of helpful accessories, including a beard oil, balm, comb, scissors, wooden brush, and a bonus shaving cream, all presented in a beautiful gift box! It doesn’t matter if the man in your life is an expert at shaving or a beginner, this kit has everything they need (minus the razor) to get started! The beard oil softens and hydrates your beard and the skin beneath it, while the balm moisturizes and conditions long after washing. The natural wooden comb helps shape and groom your beard, keeping it orderly and presenting longer hairs for the scissors to trim. The beard brush exfoliates skin gently, removing dead skin and promoting beard growth and shine. It even comes with an eBook that tells the beginner everything they need to know. It doesn’t get much better than this. 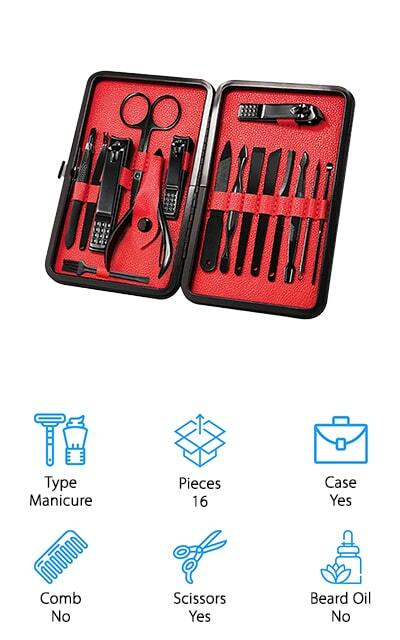 This premium grooming kit by Mifine is a manicuring set that contains 16 different pieces for making sure your nails stay healthy! All of the tools contained in the kit are made of high-quality stainless steel that is even surgical grade so it’s safe to sterilize and won’t corrode. When used properly, these materials can even greatly minimize the risk of infection. This kit comes with facial care tools, including eyebrow scissors, a peeling knife for scraping off nail polish, an ear pick, curette for acne, and tweezers. It also includes nail files, dead skin fork, cuticle knife, nail clipper, and smaller nail clippers for your nails. There are additional tools included for pedicure sets, including pedicure knives, larger toenail clippers, and a larger nail clipper. All of those tools come with a red leather travel case so you can take it with you on the go. All of the grips are textured and easy to grip. Keiby Citom makes another great grooming kit for men that contains all of the nail tools that you need. All of these tools are made of black steel that is hard and easy to work with and great to look at. They never rust, so as long as you keep them neat and dry in the carrying case they will last you a long time. The case is made of fabric and polyurethane leather, and it cuts an elegant figure that you can take with you when you’re on the go. The included clippers stay sharp for up to ten years because the blades have a double-grinding feature. The handles are non-slip and textured so that you can keep a grip on them while you’re working. These tools work well and look great, so you’ll be happy to use them. Keeping them dry and together in their case can make them last a lot longer. 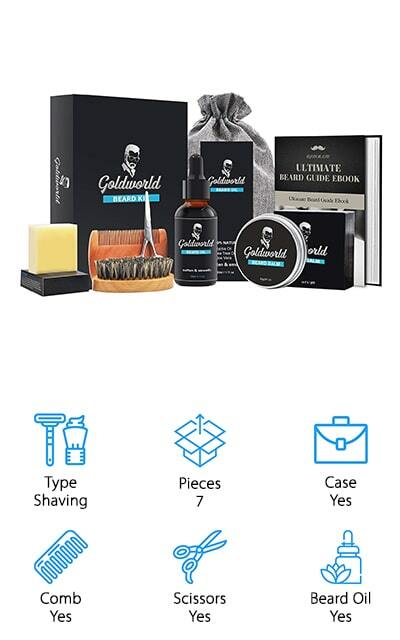 One of the best grooming kit gift sets is this shaving array by GoldWorld. It comes with an extra free beard soap that you can use to wash your beard in the shower or out of it. It also comes with a moisturizing beard oil to keep your skin and beard soft, and a balm to help condition your coarse facial hair. The beard brush can help shape and style your beard, and the comb will help you keep all the hairs where they need to be. The included scissors are great for trimming down the extra loose hairs that miss being trimmed. All of it can be stored in the included storage bag so you can take it with you on the go. You’ll always know where the extra pieces are! All of the different parts of this shaving kit help to keep your skin looking and feeling great. Get a great look without the grease! Our best men’s grooming kit reviews wouldn’t be complete without examining this kit from Beard Reverence. It’s a complete shaving kit that comes with everything you need to wash and style your beard and mustache. It comes with a travel bag to keep all of the pieces in so you don’t lose anything! It comes with a beard wash that keeps your facial hair moisturized and soft, as well as all-natural and organic beard oil and balm. These products help lock moisture into your facial hair and keep the skin underneath feeling soft while eliminating any itchiness that you might associate with heavy beards. It also includes stainless steel barber scissors for trimming up the fullness of your beards, and the comb to keep it all neat and straight is made of pear wood, so it won’t pull or snag. The palm brush is beech wood with boar bristles to help distribute oil evenly and gently exfoliate your skin. ZenNutt’s Beard Care kit contains everything you need for a great-looking beard! All of the products included are made with 100% pure and natural ingredients to help your beard look great and avoid any irritation or breakouts associated with chemicals. Keep your beard healthy with these products! It includes a beard balm and beard oil to help keep your facial hair moisturized and the skin underneath free of irritation. This comes with an extra beard conditioner to keep your beard shiny and soften both your hair and skin. Plus, it comes with scissors for small trimming needs and a comb to keep your beard straight and neat. The included comb will help exfoliate your skin, gently enough to avoid irritation while you use all of the other products. Plus, it comes with a travel bag to keep everything together! It makes a great gift for yourself or the bearded man or shaving enthusiast in your life. Comfy Mate makes one of the best male grooming kits we found during our research. 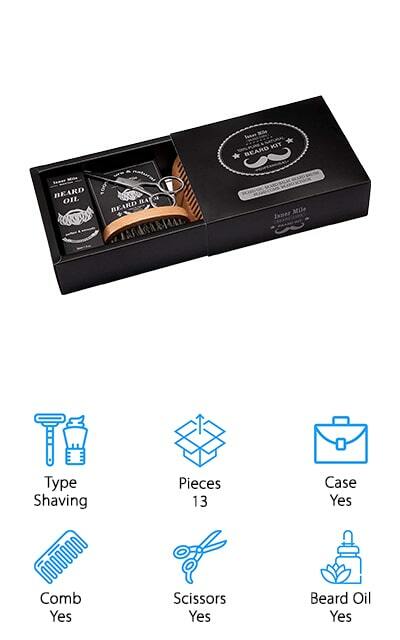 It’s a shaving kit that includes 15 pieces to make sure that your beard and mustache look amazing. It includes an unscented beard oil and balm, both made with organic ingredients that you’re going to love. They’ll keep your hair and skin soft and hydrated. It comes with a boar bristle brush that will help you distribute shaving product and oils. That alone makes this a great value. It also comes with a comb, scissors, and an eBook to help you figure out your styling technique. For a unique gift, it also comes with six hilarious beard ornaments to light your beard up like a Christmas tree! If you’re looking for a useful but humorous gift for the bearded man in your life, you should go with this Christmas-themed kit. They are sure to want to use it right away!